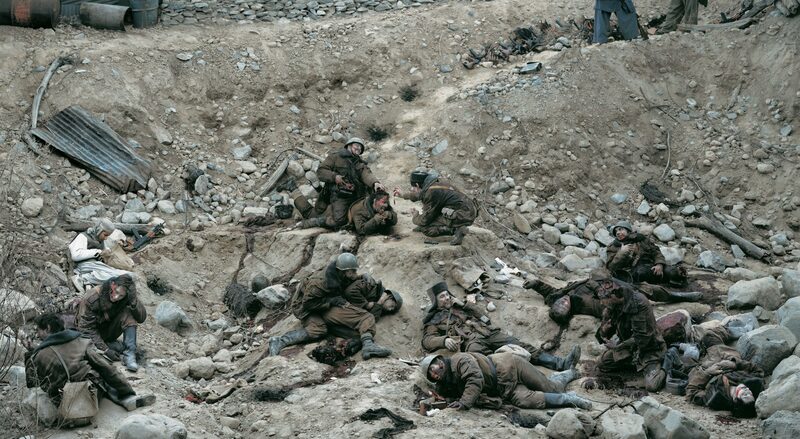 A 1992 photomontage by Canadian photographer Jeff Wall, Dead Troops Talk (A Vision after an Ambush of a Red Army Patrol, near Moqor, Afghanistan, Winter 1986), has fetched more than $3.6 million at auction. Golly. “A gruesome, large-scale battlefield picture of conversing corpses by acclaimed Canadian photographer Jeff Wall has smashed the artist’s all-time price record and become the single most valuable photographic artwork ever produced in this country. I’ve had the good fortune to see this work on display and it really is quite moving and an impressive piece of work, and also a serious bit of craftsmanship given Wall’s complicated photomontage approach. The Afghan War was current when I began thinking about the subject, sometime in the 80s, I don’t remember exactly when. Then, as the war wound down and the Soviets withdrew, it all seemed to get forgotten. The collapse of the USSR overshadowed the Afghan conflict and Afghanistan disappeared from the world’s attention until the Taliban and so on in 2001. Photography has been making some pretty big sales at auction lately, like Cindy Sherman’s Untitled #96 (Film Still) selling for $2.8 million or of course Andreas Gursky’s Rhein II breaking all records for price fetched at auction by a photo with $4.3 million … Worth noting, Gursky cites Wall as a major influence. , which presents an excellent overview of Wall’s ouevre including “Dead Troops Talk” and provides a great deal of insight into his process and thinking behind his works.